Symphonic black metallers Signs from Tbilisi, Georgia, are proud to announce that on September 1st, 2014 their second full-length album, entitled “United In Tragedy“, will see the daylight! The band was formed in 2009 and they released their debut album “Path of the Damned” via Metal Renaissance Records in the end of 2012. The worldwide digital release of their new album will be provided by french label M & O Music Productions, while New Zealand’s Satanica Records will do a physical distribution that will cover Australia, New Zealand and Oceania. The band is still negotiating for European physical release. 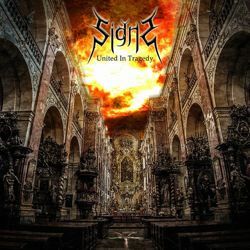 Signs revealed the cover artwork of “United In Tragedy“, made by Gravedealer studio, the tracklist and a nice album teaser, where you can get a good taste of what’s to come.